folks, it’s time this hard-working lady treated herself to a few days off from work. where to, you ask? well, if the title of this post isn’t a hint, i’m headed to san francisco. yep! a four and half hour delta flight brought me to this city on the bay for a long weekend to visit my cousin brian. i know, how exciting! he’s been living in this fair city for a little while now, and considering i’ve never spent time here, i figured a trip westward was in order. do i have much planned for my days in san fran? not much besides a wine tour on saturday. well, i take that back. i plan to practically eat my way through the city. i’ve promised myself i’ll do enough walking to justify the obscene amount of calories i’ll probably be consuming. that order shouldn’t be too tall to keep since the weather in northern california is forecasted to be pretty gorgeous during my stay. ah, thank you, mother nature, for your kindness! but first, where does each cross-country journey begin? an exhilarating flight across the nation, of course! i hustled down to the airport this afternoon with my brand spankin’ new luggage (thanks to kari for helping me pick it out at tj maxx), left it at the baggage drop, and then patiently waited my turn in the security line. 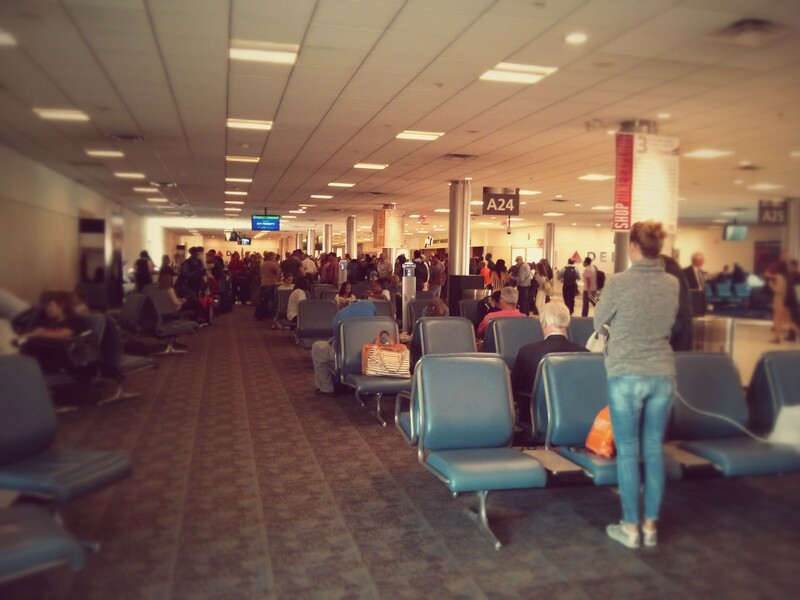 i was a bit surprised by the number of fellow travelers this time in the middle of the week. oh well, i was in no real rush, so i shuffled along and through like a good little guest. after hitting the ladies’ room and filling my water bottle, i leisurely strolled on over to gate a24. the gate attendants were getting ready to board first class, so i popped a squat and waited my turn. i am a lazy boarder, so i usually just hop on at the end. i mean, what’s the rush to squeeze yourself into a cramped airplane seat? i always check my luggage since it’s free, so i don’t mind the later boarding. plus, if you stick around the gate, you can be super touristy and take pictures of relatively boring and typical scenes. 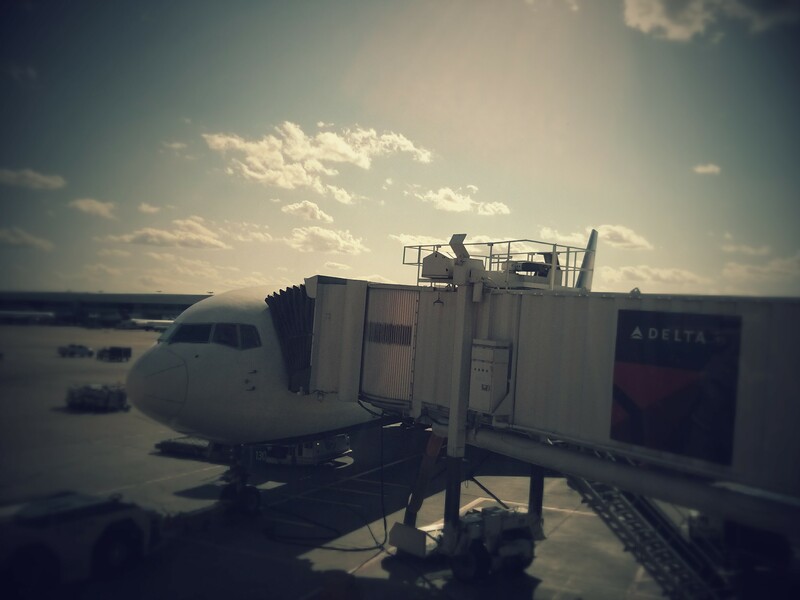 isn’t this well-framed photo of my plane and jetway super interesting? and how about this one of the gate and all my fellow flyers? we’ll be best friends long before touchdown in san fran! oh, except for this lady on the right of the picture. i’m sure she’d kill me if she knew i’d gotten this sweet shot of her white-washed jean backside. hehe. oh, and here’s my personal favorite. 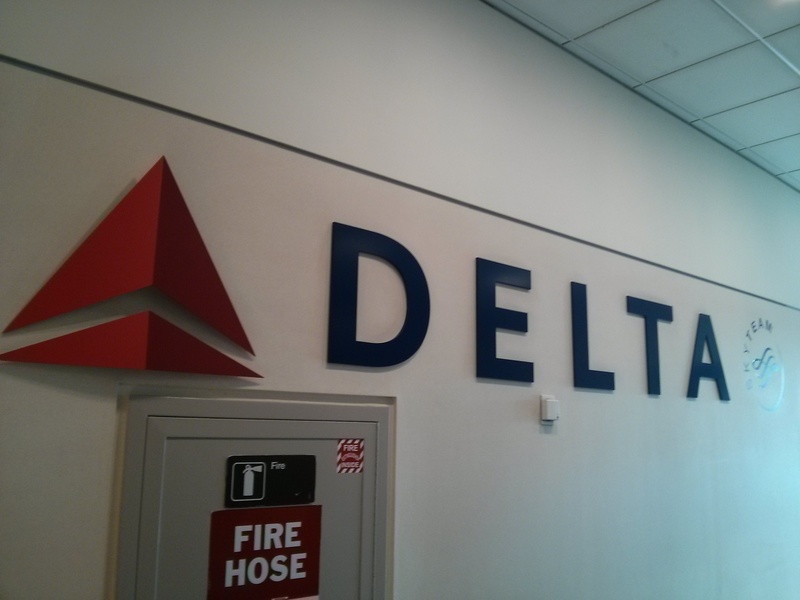 isn’t this delta sign just so picturesque with the fire hose totally photo bombing the entire thing? you didn’t think the simple act of boarding a plan could be this interesting, did you? ah, just you wait! i am a woman of many talents, one of them being the gift to make normally routine and bland life events highly entertaining. i like to think i get it from my parents. thanks, mom! thanks, dad! okay, okay, i finally got all settled in at seat b40. flying win with an aisle seat. whoop whoop! we watched the safety presentation, took off, and were ascended 10,000 feet in no time. 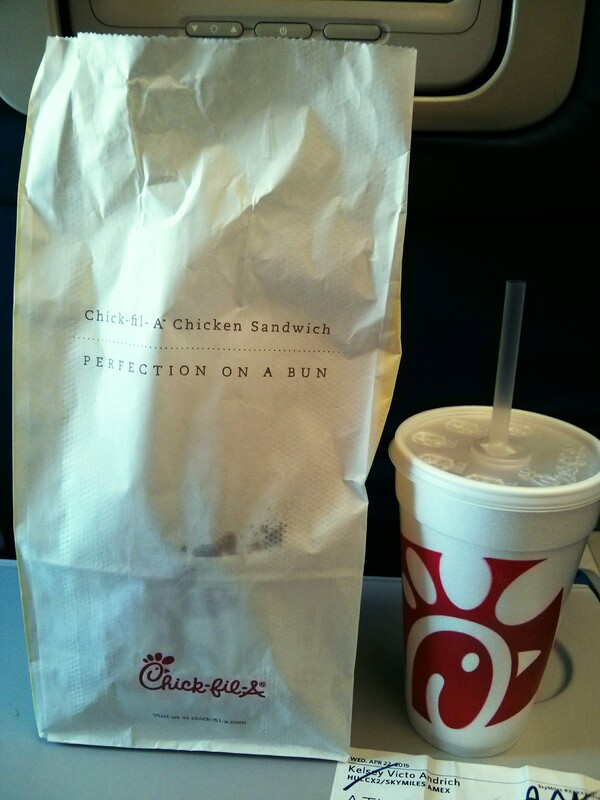 although it wasn’t quite dinnertime, i was a bit hungry, so i unpacked my spicy chicken sandwich meal from chick-fil-a. the passengers around me were green with envy, i just know it! or wait, maybe they were green with motion sickness? oh, yikes, let’s hope not. as someone who has mostly outgrown her childhood motion sickness tendencies, i know what an ugly scene it can be. i’m perfectly fine on planes now (thank goodness), but if you ever drag me on a boat, you best have some dramamine on deck. ha, on deck, on a boat. do you get it? i crack myself up sometimes! that one literally came to me as i was writing. man, sometimes life is just too good to us. i munched down the last few waffle fry crumbs and got all situated to do a little writing for you lovely folks. first, though, i needed some tunes. whenever i’m on a long flight and the tv’s are available, i build a playlist to distract me. i spent a good ten minutes picking out all sorts of different songs. for example, “best of you” by foo fighters just finished, and now i’m jamming out to tony bennett’s “the very thought of you.” yep, i have diverse musical tastes. you know what else i have? a bit of an ache in my feet from my new michael kors sandals. don’t panic, though! they’re wonderfully fabulous as you would expect them to be, but i just got them last weekend at dsw (another shout-out to kari for spotting them on the endcap), and they need to be broken in a bit. i figured wearing them a little at a time will make them more comfortable soon enough. i’ve certainly packed more comfortable footwear for this trip. yes, let’s see, if i have counted correctly, there are six additional pairs of shoes in my suitcase to accompany me. whatever. a girl has a right to shoes, and if there’s space in the luggage, why the heck not! i took a look up at my monitor and, oh, what do you know, a whole hour had gone by. time sure does fly when you’re having fun. ah, wait, i did it again, time flying when i’m on a plane in the big blue sky? you’re catching on, aren’t you? of course you are; you’re a smart cookie. i definitely need to thank you, my readers, for, in an effort to entertain you, i have, in turn, entertained myself. well, if that isn’t a win-win situation, i’ve not a clue what is! could we also call it “having my cake and eating it, too?” sure! who doesn’t love cake, right? that’s right, only people without souls don’t like cake. okay, maybe i didn’t need to take it that far…moving on! 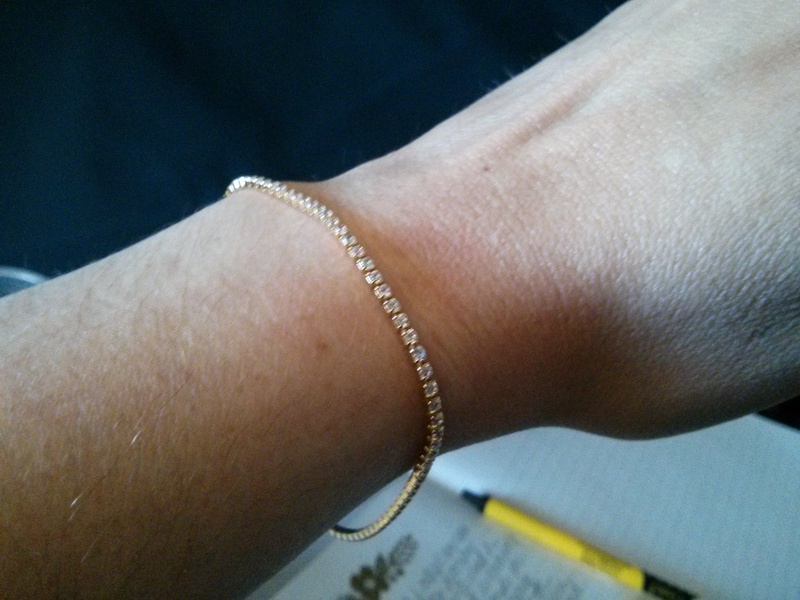 i pulled my arms out in front of me to get a bit of a stretch and noticed my new bracelet gently dangling from my wrist. i’m always adding to my jewelry collection, so isn’t it just so convenient that i have a couple girlfriends who are stella & dot stylists? ah, yes, it is highly convenient. i was browsing their site recently and came back upon the alice bracelet. i had wanted to order it back in february, but it was out of stock then. wouldn’t you know, though, that it was available again. oh, yay! i love how simple and dainty and classic it is. this one will be in my wardrobe for years to come, i just know it. i had a couple more hours to kill before we would arrive, so i spent the rest of my time listening to music and then doing a little reading. 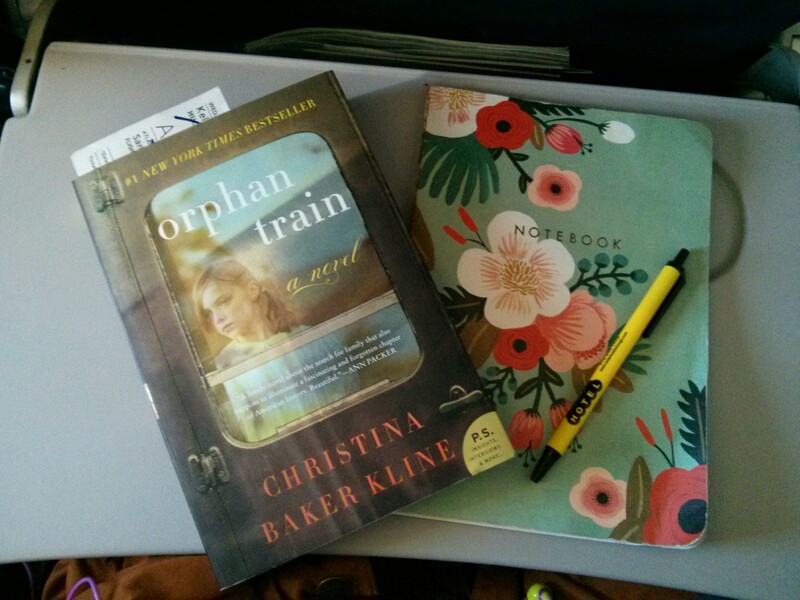 my book club is reading orphan train by christina baker kline for may’s meeting, so i thought it’d be a good idea to get a head start. i haven’t seen those ladies since december (shame on me, i know! ), so i am determined to make it to next month’s discussion. plus, kyle already had the book, so there really was no excuse. it wasn’t too long before i woke from a little nap and we were touching down in san francisco. the flight seemed quick, and even though it was close to 11 o’clock eastern time, i felt oddly energized. i mean, it’s hard not to get excited when you’re going to spend four days exploring a fantastic city with your fantastic cousin. brian greeted me right before baggage claim with a big hug, just like i would have expected. knowing my cousins as adults is such a blessing, and i’m incredibly thankful that i have the means to see them as often as i do. we might be scattered about the country, but i’ll be darned if we don’t make the effort! we wound our way through the labyrinth that is the sfo parking garage and piled into the beast ranger to head into the city. brian’s truck has been all over our great nation – he took a cross-country road trip several years back, from west coast to east coast. it’s trekked many miles and seen many things, and i hoped it would be up for more adventures while i was in town. brian navigated us to his building where he’s been living by himself a little over a year, and i’ll be honest, he has a pretty sick setup. a charming and spacious one bedroom apartment with closets for days and the most darling kitchen i think i’ve ever seen in my life. we threw my suitcase in the bedroom, and i unpacked my purse a bit so that we could head out for a drink or two. even though i was starting to feel tired, there is only so much time i’ll have while i’m here, so a girl’s gotta rally! we turned left out of the front door and walked a quick one block to dolores corner, affectionately called dolo corner by brian and the other regulars. the bartenders here know him by name, so it’s kind of like his very own cheers bar. 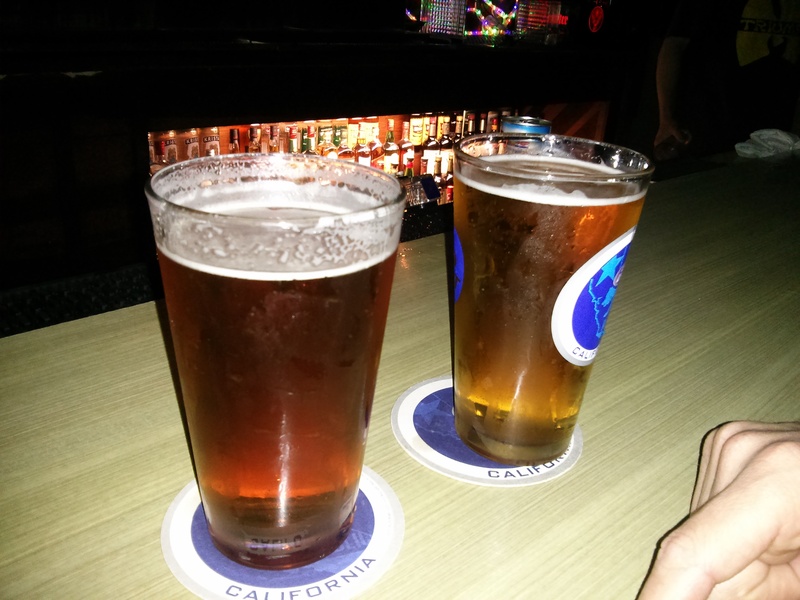 there were plenty of stools available, so we snagged a couple for ourselves and bellied up to the bar. sam the bartender greeted brian with a fist bump and introduced himself. sam’s been working here for a couple of years and loves having the locals come in for a drink. 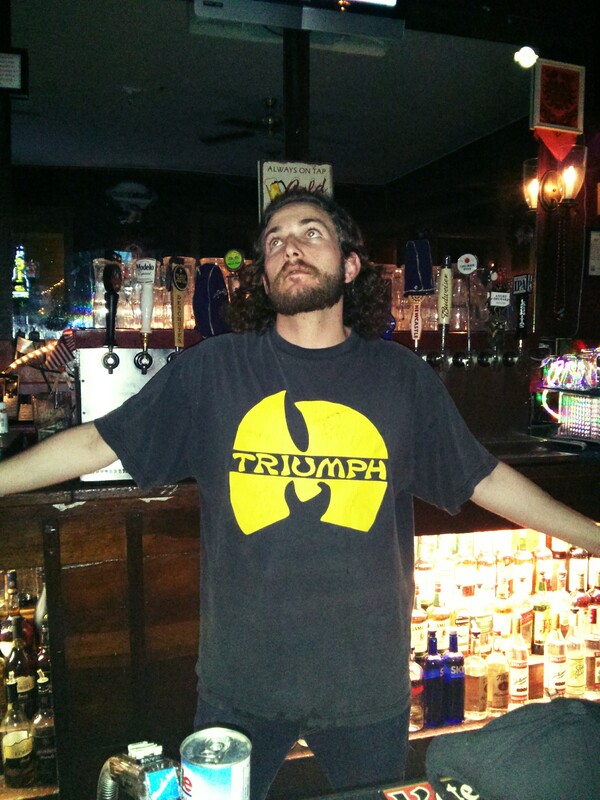 as brian’s fifth favorite bartender in town, he’s got some, and i quote, “hella Jesus-like qualities” about him. well, with a picture like the one below, i’m not sure i can disagree. brian ordered himself a modelo while i requested a local brew. sam hooked me up with the anchor steam, a drinkable caramel pale ale. so drinkable, in fact, that i had three while we were there. whoops! as we sat catching up on life, work, and love, brian and i quietly cheered on the los angeles dodgers in hopes that they would pull out a win against the san francisco giants. tied in the bottom of the ninth, the dodgers let the bases fill with only one out, and then the fate of the game was sealed with a pop-up fly to left field that let the third base runner tag up and score the winning run. shoot! even though the dodgers might not be my team, i can still cheer ‘em on. plus, have you ever had a dodger dog? yeah, it’ll change your life. here at dolo corner there is a jukebox that you can control with an app on your smartphone, a convenient yet dangerous thing because if you can select songs with your phone, you can do it from anywhere. brian admitted to having requested the same song multiple times in a row, even when he isn’t at the bar, just for kicks and giggles. haha, nice. we were feeling cutty (a local slang term for shady and sneaky) last night, so brian so cleverly requested three will smith songs back to back to back. bahahaha. ah, the simple things it takes to amuse simple minds. first up was “gettin’ jiggy with it,” a classic that everyone loves. and finally, you can’t have a will smith jukebox tribute without “miami.” aww, yissss. the midnight hour was slowly approaching, and brian and i were both in the mood for a little sustenance. he urgently requested an uber and beckoned it to take us over to mission street for some late-night rosamunde’s. with a ridiculous selection of sausage-topping offerings, i knew i didn’t want something spicy. with that request, brian was able to easily recommend the mission street sausage. sauerkraut has a special place in my heart, and since i wasn’t going to be kissing on anybody later in the night, i figured grilled onions would be an excellent choice as well. 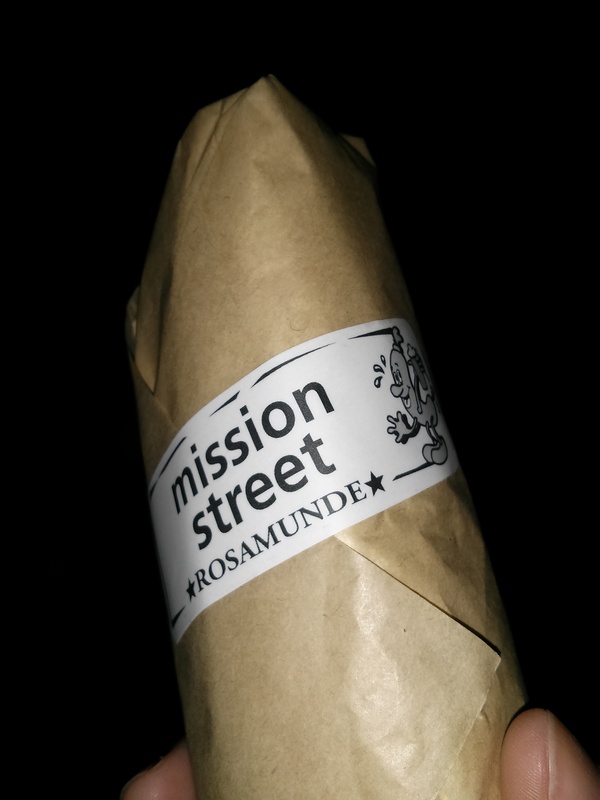 rosamunde was about to close, so we had to take our meals to go. no problem with us. 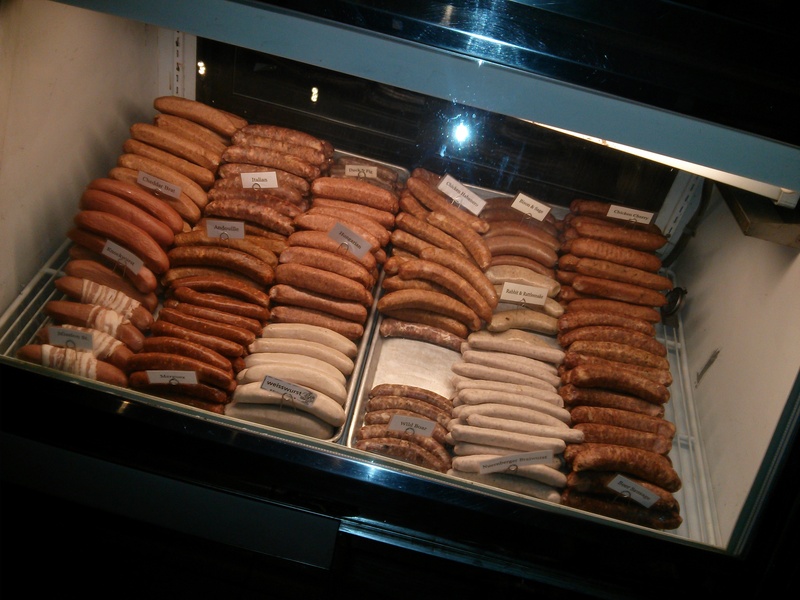 we strolled out into the night and unwrapped our sausages. the high quality of this meat is undeniable, and even though i am sometimes notorious for not being able to finish a meal, i ate every bite of that sausage. the sauerkraut with the sweet onions was a killer combination. the only thing missing was the bacon that was supposed to be wrapped around the sausage. i’ve no doubt it would have made it even better, but as a whole, it still was an excellent first meal for this foodie. with drink and food in our bellies, we were ready to call it a night. after all, we did have an early morning hike to get to before brian had to be at work. we crashed pretty quickly upon our return to the apartment, and considering my body was still three hours ahead due to the time change, i assure you i slept like a rock. it’s a good thing i was able to rest up, because who knew what thursday in san francisco would hold for me!